This year, the Biscayne entity has brought together representatives of 43 companies, 25 clubs and 28 teams (fifteen women, twelve men and a mixed one) that sponsors more than one million euros to be able to compete at the highest level in 18 Sports. It is also worth noting the important presence of the women’s teams supported by the foundation. The president of Bizkaia Bizkaialde Foundation and deputy of Basque and Culture, Lorea Bilbao, has presided over the event in which she has put in value and thanked the efforts of the entities that bet to support the sport of the Territory. “The Bizkaialde Foundation works to strengthen the sports muscle that drives clubs so that they can stay on the crest of the wave and make their dreams come true,” said the deputy. “Today, more than ever, sport in Biscay needs us, and I take this opportunity to appeal once more to your social commitment to the Biscayne sport and Biscay, and we need each and every partner to continue improving, to continue Obtaining results, so that Biscay continues to grow”, she added. 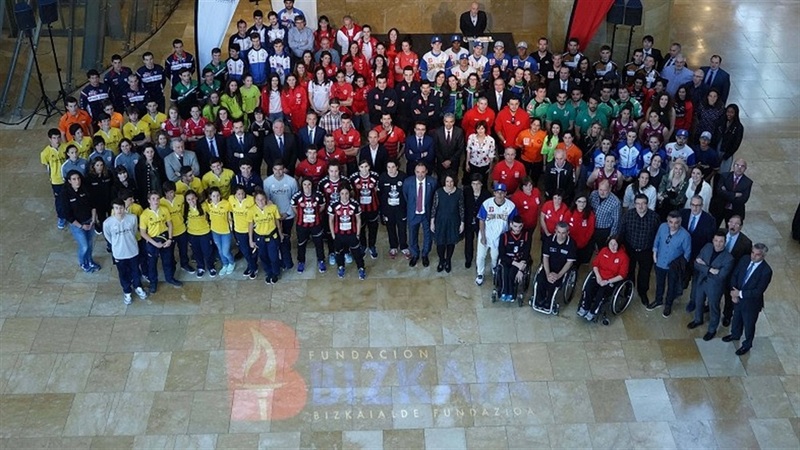 Under the motto “sport in Biscay needs us”, Bizkaia Bizkaialde strengthens the sport’s muscle in the Territory by supporting clubs in the elite sports of Biscay. In order to achieve this goal, Bizkaia Bizkaialde helps to make economic efforts of public and private entities that support the sport. Below we detail the list of clubs sponsored by the Bizkaia-Bizkaialde Foundation during the 2016-2017 season: Sestao Chess Club, Bidezabal Athletics Club, Santutxu Bilbao Athletics Club, Gernika Kebs Basketball Club, Bidaideak Bilbao BSR Basketball Club, Zuazo Handball Club , Club san francisco San Ignacio, Cycling club SDUgeraga-Lointek, Cycling club CDC Duranguesado Velodrome, Athletic Club Football Club, Bilbao Football Club, Stilo Kirol Kluba Football Club, Sakoneta Gymnastics Club, Herri Club Kirolak Gaztedi Sokatira , Jolaseta Hockey Club, Askartza Water Polo Swimming Club, Leioa Water Polo Swimming Club, Metropolitan Skating Club, Kaiku Rowing Club, Zierbena Rowing Club, Bermeo Rowing Club, Ondarroa Rowing Club Arraun Elkartea, Arraun Taldea, Gernika Rugby Rugby Club and Getxo Rugby Rugby Club.